Heartland Regional Committee recognizes USGBC-Missouri Gateway Chapter Volunteers! The USGBC’s Heartland Regional Committee recognized several of USGBC-Missouri Gateway Chapter Volunteers as Volunteer Superstars! Congratulations to these volunteers! And thank you to all of the members, volunteers, sponsors, and partners working to transform the built environment! Want to join them? Become a member, volunteer or sponsor today! USGBC-Missouri Gateway Chapter is accepting proposals for educational programs to be offered in 2015. USGBC-Missouri Gateway Chapter strives to offer a diverse selection of educational programs to educate our members and community on current green building principles and practices and to expand the opportunities for LEED Professionals to gain continuing education hours. We are particularly seeking in-depth workshops – extended consideration of topics to build upon green building professionals’ existing knowledge. Call for Proposals Issued September 16, 2014. Proposals due by Sunday, October 26, 2014 at 11:59 PM CST. Selected Speakers notified by November 26, 2014. SUBMIT YOUR PROPOSAL TO USGBC-MGC! Missouri Interfaith Power & Light and the U.S. Green Building Council – Missouri Gateway Chapter are partnering to provide free energy audits to 10 congregations within the USGBC-MGC territory. The effort is part of the 25 x 20 Voluntary Energy Benchmarking Campaign, and audits are courtesy of a grant from the national USGBC. Energy auditors from Microgrid Energy and Ross and Baruzzini will be conducting the 10 audits over the coming months. 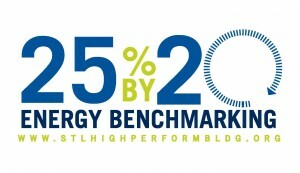 We encourage all congregations to take the 25×20 Pledge to benchmark their energy use! Energy benchmarking is the process of measuring how much energy a building consumes and comparing that to other buildings. As the saying goes, you can’t manage what you don’t measure! The EPA’s ENERGY STAR for Congregations program is designed specifically for congregations benchmarking their energy use, and has numerous resources available to help congregations benchmark. Their Tip Sheet on No and Low Cost Energy Savings for Congregations is a good place to start, and a full list of resources is available here. Missouri Interfaith Power & Light engages faith communities to be stewards of God’s creation by addressing the environmental and social justice consequences of climate change. They have resources available to congregations interested in reducing their energy consumption. Ameren Missouri offers financial incentives for energy efficiency improvements through their BizSavers program. Congregations can learn more or apply for these incentives on Ameren’s Bizsavers website. Laclede Gas offers rebates for the implementation of natural gas energy efficiency measures, including part or all of the cost of an energy audit that is performed in support of any measure that receives a rebate. Congregations can learn more about these rebates on Laclede Gas’s website. Questions? Contact the USGBC-Missouri Gateway Chapter at usgbc-mogateway@mobot.org or (314)577-0884. USGBC-Missouri Gateway is seeking nominations for three (3) Board Members. Nominations are due by midnight on Monday, October 6, 2014. Elections will be held on-line November 6 – 12, 2014. Please note that in order to vote in the elections, you must be a USGBC-Missouri Gateway Chapter member in good standing on Friday, October 31, 2014.